Home » WOD Blog » True and false. Today we will be utilizing the warm up portion to work on ring skills. Regardless of where you are at with muscle ups, dips, push ups, etc, there will be some skill you can focus on. While good pull ups and solid dips are prerequisites for muscle up glory, the first step is learning the false grip. To set a false grip, you need to get the base of your palms on top of the rings, your thumb will remain on the opposite side of your fingers. The importance of this is two-fold. First, it shortens your arm so you have less leverage to deal with and second, it allows you to push from the base of your palm as soon as you reach the bottom of the dip position. So today you may start with just the false grip. 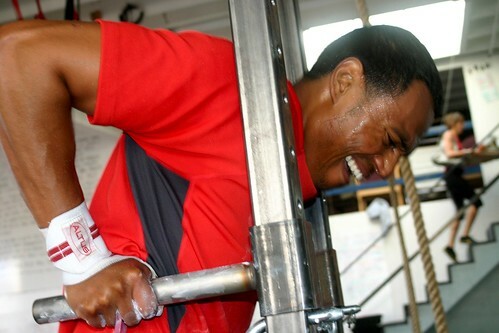 Get in position and just hang there, or you can practice performing ring rows or pull- ups in the false grip. This is a great way to get your wrists, forearms, and elbow joints strong for the muscle ups to come!